Oranges are not only one of the best sources of natural fluids/water for the human body, but its skin is also a very valuable medicinal asset (provided it is cleaned of all insectisides, wax et al!). Naturally everyone knows about their high contents in Vitamin A beta Carotene and other irreplaceable vitamins. Combined with other foods it can help prevent cancer like other ctrus fruits! 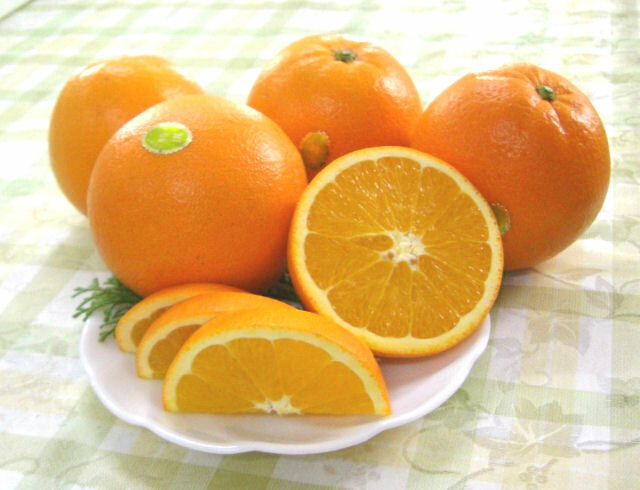 In Japan, depending on the season, oranges will be called natsu mikan/夏みかん/Summer oranges, haru mikan/春みかん or even fuyu mikan/冬みかん/Winter oranges and accordingly will be available im more varieties. The satsuma (Citrus unshiu) is a seedless and easy-peeling citrus mutant of Japanese origin introduced to the West. 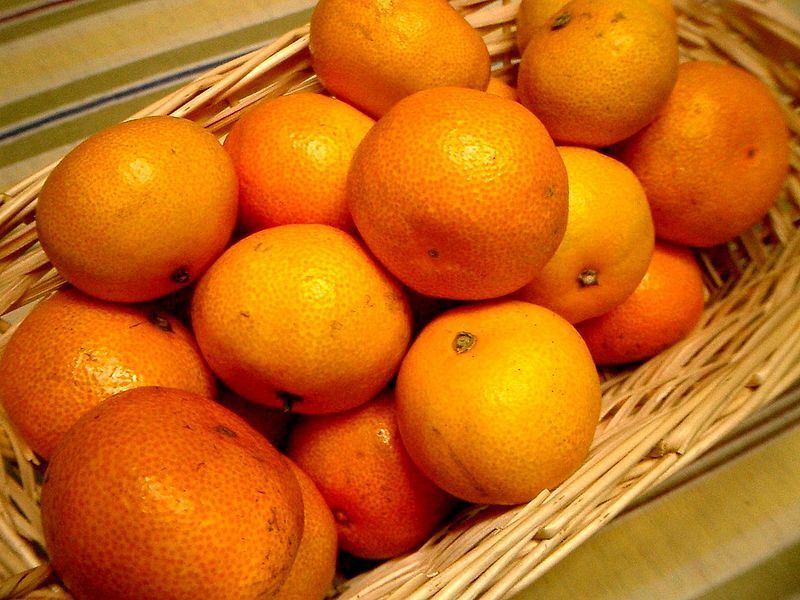 In Japan, it is known as mikan or formally unshu mikan (Japanese: 温州蜜柑, unshū mikan). In China, it is known as Wenzhou migan (Chinese: 温州蜜柑; pinyin: Wēnzhōu Mìgān). The Japanese name is a result of the local reading of the same characters used in the Chinese, the name meaning “Honey Citrus of Wenzhou” in both languages. It is also often known as “Seedless mandarin” (Chinese: 无核桔; pinyin: wúhé jú). The Korean name for the fruit is gyul (Korean: 귤). Shizuoka Prefecture is a major growing region in Japan. Depending on the growing area, they will come up with many brand names. Also simply called “Oranges”, The Valencia Orange is an orange first created by the Californian agronomist William Wolfskill, on his farm in Santa Ana. Its name comes from the Spanish city of Valencia, widely known for its excellent orange trees. Most in Japan are imported from the US for their good value as orange juice. 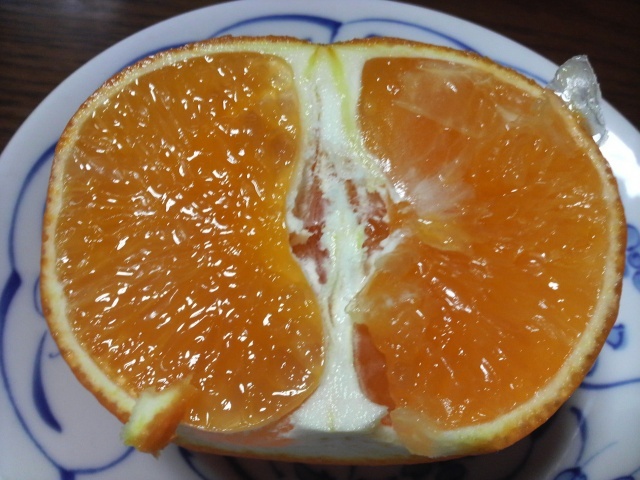 A variety grown in Oita Prefecture, Kyushu Island, Miko Orange is difficult to grow and is comparatively expensive, but very juicy with a beautiful aroma. Setoka are remarkable fortheir rich skin. That skin being thin, it ios very easy to peel. Very juicy and sweet. 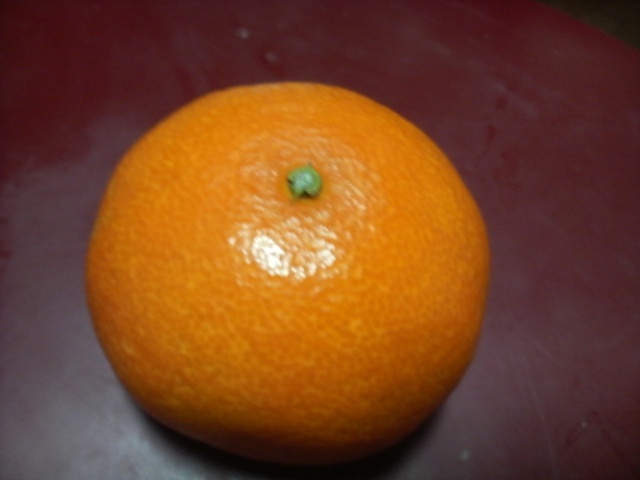 Slightly bigger than Unshu mikan. Blodd Oranges are called so because of the colour of their flesh. They are particularly popular for fresh pressed juice. 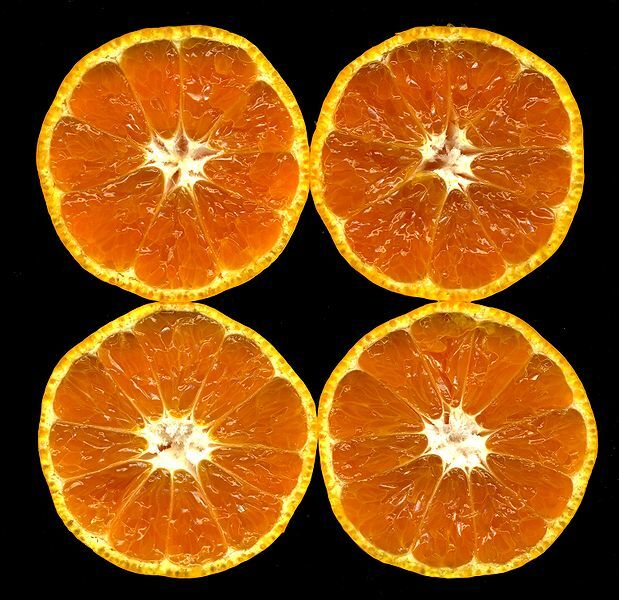 A single mutation in 1820 in an orchard of sweet oranges planted at a monastery in Brazil yielded the navel orange, also known as the Washington, Riverside, or Bahia navel. 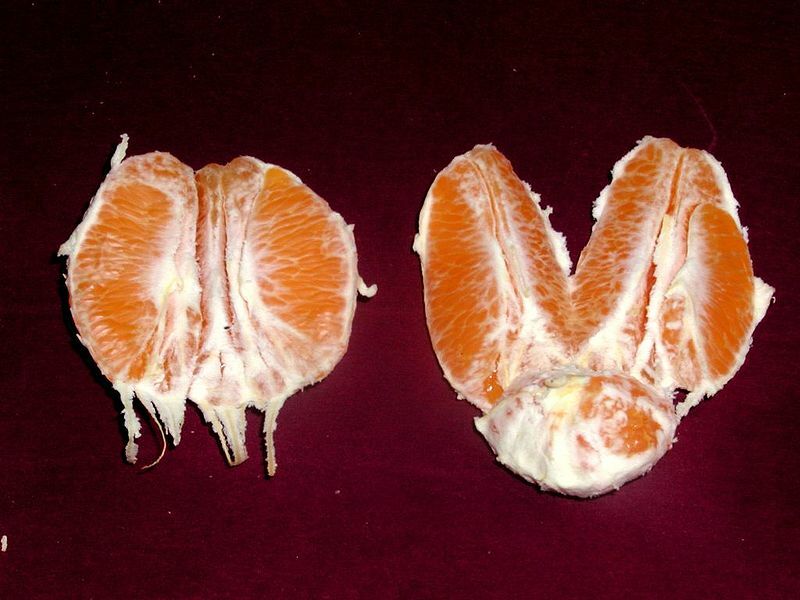 The mutation causes the orange to develop a second orange at the base of the original fruit, opposite the stem, as a conjoined twin in a set of smaller segments embedded within the peel of the larger orange. From the outside, it looks similar to the human navel, hence its name. 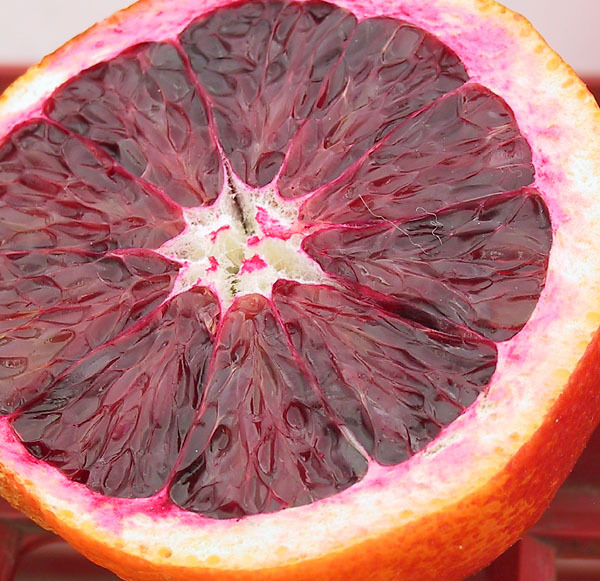 Because the mutation left the fruit seedless, and therefore sterile, the only means available to cultivate more of this new variety is to graft cuttings onto other varieties of citrus tree. Today, navel oranges continue to be produced via cutting and grafting. 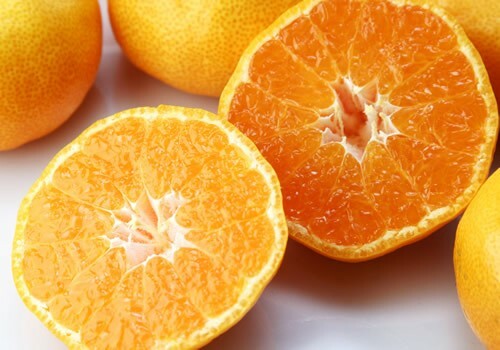 This does not allow for the usual selective breeding methodologies, and so not only do the navel oranges of today have exactly the same genetic makeup as the original tree, and are therefore clones, all navel oranges can be considered to be the fruit of that single nearly two hundred year-old tree. he Japanese varieties are available around February and March, making for an invaluable late winter orange. -Choose specimen with a uniform colour and bright colour. -Combined with asparguses, or with turnips, or with beansprouts, or with potatoes, will re-inforce the digestive system, help prevent common colds, and help recover from constipation. -Combined with broccoli, or with chingensai, or with shiitake mushrooms, or with strawberries, will help prevent cancer, obesity and common colds. Loved your blog on Sansei!!! I grow specialty citrus in california. I have access to yuzu and sudachi bud material, but would like to also grow naoshichi, dai-dai, kabosu. etc., non of which genetic material are currently available. Hopeful of finding an avenue by which that japanese germplasm may be shared with the citrus germplasm repository here in California. Any recommendation and/or guidance would be appreciated. Further, i am always interested to learn more recipes that use japanese citrus. Perhaps you would consider added a blog with that focus.